I don't know about 1980s Humbrol paint, but today I have found a shop that stocks Humbrol paints. -- And it is an ordinary store, not a model shop. that passes for paint they need different outlets ? More wagon work going on, but not taken any photos. I'd love to know how out-of-the-box US models fair, assuming the come pre-fitted, or do American modellers have to fit their own? The height gauge seems to feature as an important item so do they have some fiddling to do? It would have been so easy to standardise the NEM pocket further back, then produce European and KD couplers with longer shanks. The mini tensionlock can't be made any shorter and the gap between wagons is now glaringly obvious. height gauge isn't that much good. ones wagons need to be harmonized to YOUR standard. to be highly accurately set on all so fitted stock. but ANY small variance can influence your Kadees. tension-locks, but easily enough cause Kadees to be unreliable. but every layout have variables and too tight will cause derailments. Quite a lot to get right me thinks. and had my attention until 17.20 ......... On just 1 magnet !!! My modeling goes back far enough to have used the Hornby Dublo/Peco Simplex knuckle type coupling. It was a vastly overscale device that needed frequent straightening and tweaking and I suspect it would fail to couple most of the time on modern free running stock. When introduced there was probably nothing better, suitable for mass production, it had the advantage that you could lift one wagon from the middle of a train without a problem. They could be uncoupled magnetically provided the field was vertical, but they were equally as ugly as original tensionlock and could be tempremental when collecting a lone wagon, on a bad day you could end up chasing it to the buffers. Has anyone tried using the standard "N" gauge coupling on 00 gauge stock, the "N" gauge couple looks equally overscale on the stock for which it is intended (even more so perhaps) but it would look quite neat on a 00 gauge loco. An interesting idea luckymucklebackit, especially if used with SR stock, but like the broad gauge, isn't it just a little bit too late? Errr No, I tried working in 'N' once and it's just too small. I've spent many hours watching the Kadees, and making subtle adjustments. I hope I've found a way of using them with a high degree of operational reliability. For 'West Bay' I must have 100% free shunting available. can pull against this increased resistance. sliver of plastic. They now sit in line - a basic requirement. Having to do that makes a nonsense of the NEM pocket, but if manufacturers involved in the UK market can't even agree on the dimensions of the non patented slim tensionlock what chance do we have? fixed magnet where we do little more than drop the train. Jim's thought on adopting or adapting the N gauge coupler to 00 would be history repeating itself. The original Triang tensionlock for 00 was the one that they had developed for their TT3 range, with virtually no change to the coupler, just the provision for the centre fixing on the 00 chassis. The original Triang (big ugly) chopper fitted onto a slotted plastic block with a horizontal rivet through it. When someone suggested changing the 00 to tensionlock someone else pointed out that the TT3 coupler would fit with minimal changes. 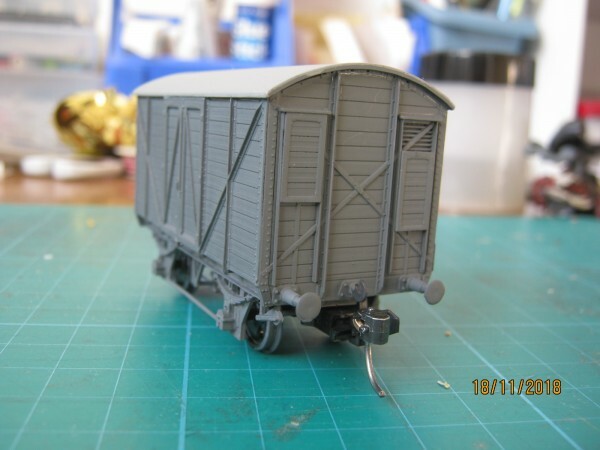 Geoff - is West Bay Wagonworks going to take on the recovery and restoration of one of the grounded van bodies being given away by Railway Modeller? Probably, If I get one ...... or more ? is right you can forget that ! 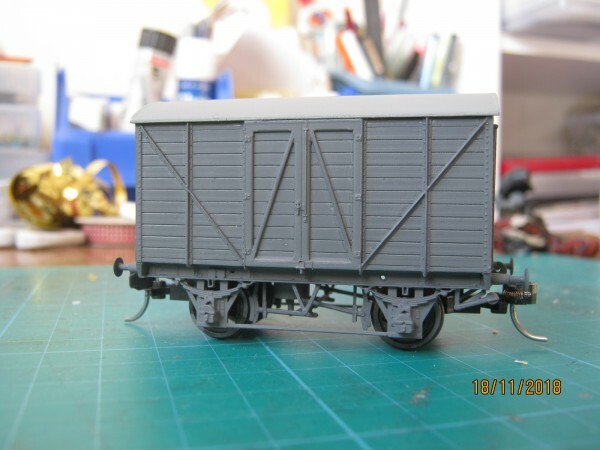 do was start a Parkside PC84 10ton GWR Mink 'A' goods van kit. of the solebars and end panels. subsequent coats. This one is a nice kit with good deep details.